We will base our research and writings on the truth-seeking principles outlined by Luke, a follower and contemporary of JESUS CHRIST during the first coming, and author of the Gospel of Luke and the Book of the Acts of the Apostles. To compile accounts of things accomplished among us in our day and age, particularly the workings of members of the Body of CHRIST influencing various fields of mission locally and abroad (also including government, medical, science, film, music, literature, etc.). To investigate and follow carefully from the beginning - that is, explore historical precedents, examine primary sources and contact eyewitnesses that offer insight into current events, and educate readers, viewers and listeners that might not otherwise have access to these materials. To write out these findings in a consecutive, logical order and communicate them both efficiently and creatively; devote ourselves to the study of languages and cultures that will help us better understand and communicate as such (i.e., Hebrew, Greek, Aramaic, Latin...and contemporary languages). To (with prayer for anointing from the HOLY SPIRIT) present the intellectual case for the Faith and Hope that is in us (the Biblical Worldview - 1 Peter 3:15), so that other believers (and nonbelievers whose hearts and minds are open) may know the exact truth about the things they have been taught. Thank you so much for your comment! I have enjoyed looking at your sites. 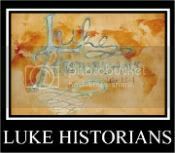 I am interested in becoming a Luke Historian. What would it involve? How should I go about it?